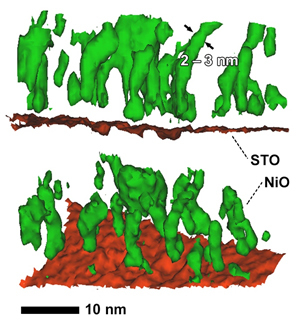 Three-dimensional mapping of delayed phase separation in an oxide material, shown as a gap between the substrate (red = SrTiO3) and phase-separated regions (green = NiO). Image courtesy of Pacific Northwest National Laboratory Enlarge Image. Controlling the formation of defects is an important aspect of designing next-generation spintronic materials. Such materials would use the spin degree of freedom found in electrons, rather than the charge, as is currently used, to do computing. Significantly, defects can effectively erase the information the spin carries. However, it is often difficult to predict how, when, and why such defects form. Researchers have examined the onset of an unusual kind of defect that forms in crystalline films of complex oxides and have suggested a new mechanism for its occurrence, in addition to suggesting ways to mitigate the process. The group showed that formation of nanoscale secondary phases within the host film material can result from electrostatic interactions between the film and the substrate on which the film is grown. "By understanding these interactions, we can begin to precisely engineer spintronic materials with exciting and useful properties," said lead author Dr. Steven Spurgeon, a materials scientist at PNNL. A group at Pacific Northwest National Laboratory examined the film growth of a promising oxide material for spintronics and observed the occurrence of an unusual phase separation that occurs. The material grew in a completely uniform fashion up to a certain film thickness at which point a second, simpler oxide phase nucleated as nanoscale particles within the host material. This unusual phase separation did not correlate with strain relief, the usual cause of defect formation that typically occurs as the film gets thicker. Rather, the group traced this onset to the formation of oxygen vacancies which are in turn driven by the electronic interaction of the film with the substrate. The group’s findings suggest new ways to control the film growth to mitigate this undesirable process. Materials scientists typically set out to synthesize a specific crystalline material with the desired properties, but their efforts are often foiled by the presence of unwanted defects that can degrade performance. These defects are sometimes hard to detect, particularly when they occur on the nano- or atomic scale. In this study, Pacific Northwest National Laboratory researchers examined thin films of La2MnNiO6, in which they had previously found a network of unexpected nanoscale particles of NiO. They set out to understand the mechanism(s) driving the formation of these particles to see if the process could be controlled. Using a combination of scanning transmission electron microscopy and atom probe tomography, the researchers examined various films and their underlying substrates in 3-D. Surprisingly, they found that the first several nanometers of the film did not contain any NiO precipitates, and it was not until the film had grown to certain thickness that this phase separation occurred. At first they thought the NiO particle formation might be a result of the strained La2MnNiO6 film relaxing to its normal lattice dimensions as its thickness increased. However, both X-ray diffraction and electron microscopy measurements showed this wasn’t the case. The researchers then realized that the substrate on which the films are grown (SrTiO3) could affect the formation of defects in the growing films via an electrostatic interaction between La2MnNiO6 and SrTiO3. Density functional theory calculations confirmed this hypothesis. A voltage drop across the La2MnNiO6 film, which can naturally occur because of differences in the electronic structures of La2MnNiO6 and SrTiO3, can drive the formation of oxygen vacancies. These point defects can in turn initiate the formation of the larger NiO defects. These results suggest that NiO precipitate formation could be suppressed to greater film thicknesses either by modifying the interface composition to prevent formation of the voltage drop across the La2MnNiO6 film, or by significantly increasing the oxygen flow rate during film growth. Sponsors: This research was managed for the Department of Energy, Office of Science, Basic Energy Sciences, Division of Materials Science and Engineering (10122, KC0203020, Electronic, Magnetic and Optical Properties of Epitaxial Films and Interfaces). User Facility: All work was performed in the Environmental Molecular Sciences Laboratory, a national science user facility sponsored by the Department of Energy's Office of Biological and Environmental Research and located at Pacific Northwest National Laboratory. Research Team: Steven Spurgeon, Petr Sushko, Arun Devaraj, Yingge Du, Tim Droubay, and Scott Chambers, Pacific Northwest National Laboratory.